This is just a quick post to revive this increasingly silent blog. I actually wanted to bake something but I decided against it because there were too many calorific goodies lying around in my house already so I went with something that I could finish by myself. For those who are hearing of this for the first time, oshiruko is basically a kind of japanese red bean soup. I believe zenzai is its more commonly heard counterpart, which is thicker than oshiruko. This isn't a dessert that is designed to wow; it's just something very homey and comforting, which is quite a nice respite from all the rich layer cakes and butter laden cookies. I served it with some homemade black sesame paste which I think goes really well together with this soup! It's a breeze to whip up - just blend some toasted black sesame seeds with a third of that in volume of caster sugar until it achieves paste-like consistency - so if you have a little bit of time to spare, do try it! You can adjust the quantity of water as you like to make it thinner or thicker. 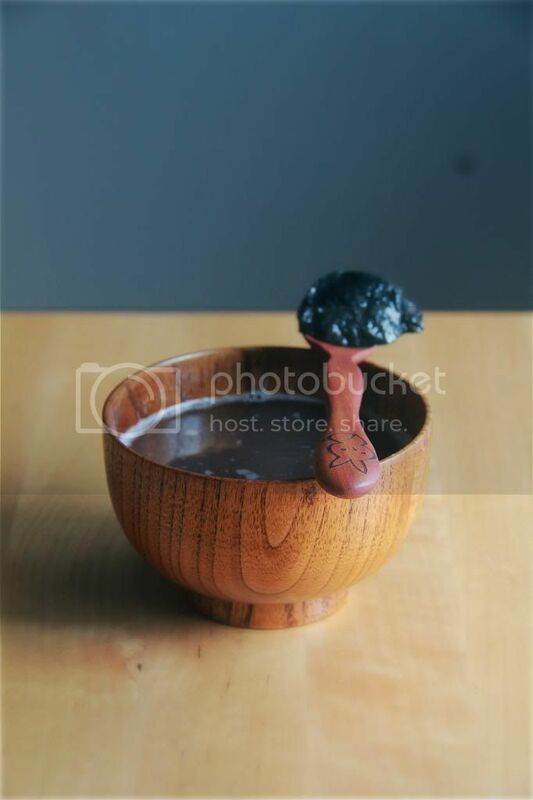 Combine the red bean paste and water in a small saucepan and bring to a boil, stirring. Remove from heat and serve. This looks delicious - I love red bean paste, and I imagine it's a very warming dessert/light treat :) It reminds me of che dau xanh, a lightly sweetened dessert vietnamese soup made of yellow mung beans! Very interesting. I've never heard of this soup before. Thank you for sharing with the Clever Chicks Blog Hop!